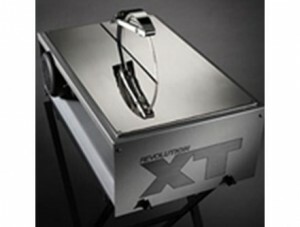 The Revolution XT saw offers endless length and width ability without the need of a cumbersome water pump. The capability of cutting endless shapes through any tile surfaces is what sets this saw apart from others. This portable saw can easily be handled by one person and is an excellent choice for all of your glass cutting needs. It uses a 10 inch Sintered Diamond Blade (Single-sided and Double-sided blades available).